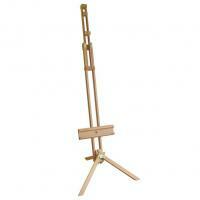 Radial easels are often seen in art schools and artists' studios. They are made from a tripod of short legs which support an upper section hinged just above the three legs allowing the artist to tilt it to adjust their working angle. A sliding support can be moved up and down the upper section to accomodate canvases of different sizes. Radial easels are not as stable or strong as H frame easels, but they cost considerabley less and they can be folded up much smaller when not in use.